One of the key features of social media is that it makes people more accessible on a global stage. You can make friends and follow people from virtually anywhere in the world. This makes it tricky when creating regional influencer listings. The celebrity influencer with the most UK followers is American singer, Ariana Grande, who has a Sicilian and Abruzzese Italian background. But for the purposes of this list, we only include influencers who identify as being from the UK. Some, like David Beckham, have spent years living outside the UK. The majority of his social media followers are probably, likewise based outside the UK. However, Beckham did make his name playing football for England, so can definitely be considered a UK influencer – although definitely a celebrity influencer, rather than a micro-influencer. 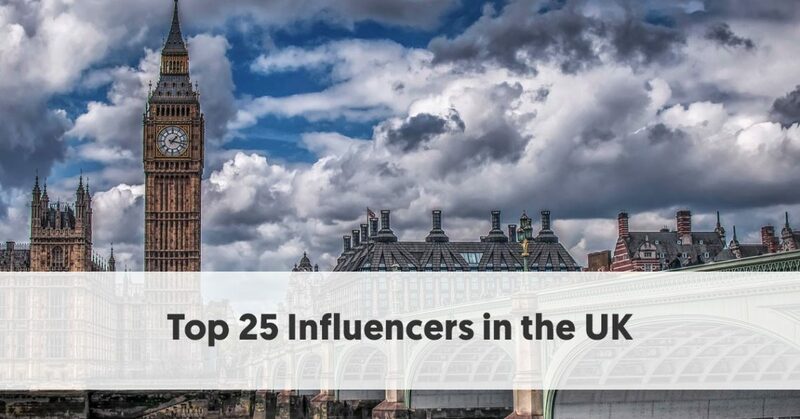 All of our top 25 UK influencers have more than a million Instagram followers (from around the world). Instagram is arguably the most popular social network for influencer marketing. Many of our Top 25 are also popular on other social networks, however, and we have included their other social accounts of note. Quite a few made their name on YouTube, and that is still their primary online home. While some like David Beckham and Emma Watson are unquestionably celebrities, most of the people on this list are macro- or micro-influencers, best known within a particular niche of expertise. David Beckham is definitely at the celebrity end of the influence spectrum – and probably outside the budget of most brands. At 43, he may be an “old man” compared to most people on this list, but his celebrity status and success can’t be denied. Beckham is a retired English professional footballer and was the first English player to win league titles in four countries. Emma Watson gained fame playing Hermione Granger in the Harry Potter films series. She has continued her acting career and has branched out into modeling. In 2005 she became the youngest person to appear on the cover of Teen Vogue. She was awarded Best British Style at the 2014 British Fashion Awards. Watson has also taken on women’s rights activism. She was appointed as a UN Women Goodwill ambassador in 2014. Cara Delevingne is an English model and actress. She won the "Model of the Year" award at the British Fashion Awards in 2012 and 2014. She quit modeling in 2015, shifting her focus to acting. She starred as one of the main characters in Luc Besson's Valerian and the City of a Thousand Planets in 2017. Gareth Bale is a Welsh footballer who plays as a winger for Real Madrid. ESPN ranked him twelfth on its list of the world's most famous athletes in 2016. Bale made his international debut for Wales in May 2006 and has now earned over 70 caps and scored 29 international goals. He is Wales' highest scorer of all time. Zayn Malik is a 25-year-old English singer and songwriter. He initially made his name as part of the boy band, One Direction. He left the group in 2015 and signed a solo recording contract with RCA Records. When Malik released his first solo album in 2016, he became the first British male artist to debut at number one in both the UK and US with a debut single and debut album. Harry Styles also found fame as a member of One Direction. He signed a solo record deal with Columbia Records in 2016. He released his debut single "Sign of the Times" in April 2017, reaching number one in the UK and number four in the US. Styles made his film debut in Christopher Nolan's war film Dunkirk (2017). Niall Horan joins fellow One Direction members Zayn Malik and Harry Styles near the top of the Brit social media rankings. One Direction released five albums, embarked on four world tours, and won several awards. Horan signed a recording deal as a solo artist with Capitol Records in 2016 and began releasing solo material the following year. His first album debuted at number one in Ireland and the United States. 19-year-old Brooklyn Beckham is the second member of the Beckham family to make this list, being the eldest son of David and Victoria Beckham. His godfather is Elton John, and his godmother is Elizabeth Hurley. Brooklyn Beckham has followed his father into modeling work, He has played football at the Arsenal Academy and played for Arsenal U16. He recently dropped out of New York University after a year, preferring to focus his attention on a photography internship back in the UK. He changed his Instagram account to private shortly after his departure from New York University, but he has since returned it back to public. Zoe Sugg is an English fashion and beauty vlogger, YouTuber, and author. She created her blog in 2009, calling it Zoella. She has subsequently used that name on her incredibly popular YouTube, Instagram, and other social accounts. Many consider her the world’s premier influencer in the fashion and beauty niche. Her YouTube channels are particularly popular. Sam Smith is an English singer-songwriter. He released the first single from his debut album, "Lay Me Down" in 2013. He also featured that year on Naughty Boy's single "La La La," which peaked at No. 1 on the UK Singles Chart. He released his debut studio album, titled “In the Lonely Hour,” in 2014. It reached Number One in the UK Albums Chart and Number Two on the Billboard 200. Smith and Jimmy Napes composed "Writing's on the Wall," the theme song to Spectre, the 24th James Bond film. This led to them winning the Award for Best Original Song at the 73rd Golden Globe Awards. Olajide William "JJ" Olatunji is better known as KSI. He is a British YouTube personality, internet celebrity, comedian, actor, rapper and white-collar boxer. He is particularly well known for his YouTube channel, which he established in 2016. It is the 41st most subscribed channel on the platform. KSI featured in the video "KSI VS FIFA // The Record Slam" made by GWRomg in 2013. That video showed him breaking the previous world record for 'the most goals scored against computer' (110 goals), by scoring 190 goals. As a result, he made it into the Guinness World Records Gamer's Edition. In 2011, KSI branched out into music, mainly as a rapper. More recently, in February 2018, KSI competed in his first white-collar amateur boxing match against fellow YouTube personality Joe Weller. He then fought Logan Paul in another match (with his younger brother, Devi also fighting the younger Poole brother, Jake). Joe Sugg is a British YouTuber, film-maker, author, and vlogger. He is Zoe Sugg’s younger brother. He is best known for his YouTube channels. The name he chose, ThatcherJoe, reflects his training as a roof thatcher. His videos are mainly challenges, pranks, and impressions. He was a member of the YouTube Boyband that raised money for Comic Relief. He also featured in the 2014 version of charity song, "Do They Know It's Christmas?" Alfie Deyes is an English YouTuber, vlogger, property investor and author. He named his main YouTube channel PointlessBlog, and has also used this name on most of his other social channels. He was named by Yahoo! News as one of "12 Web-savvy entrepreneurs to watch" in 2013. He was included in the 2015 Debrett's 500, listing the most influential people in Britain. He has authored three books - The Pointless Book, The Pointless Book 2, and The Pointless Book 3. He also published his autobiography, The Scrapbook of My Life in 2016. Iskra Lawrence is an English model represented by JAG Models and Models1. She is the global Role Model for Aerie. She makes a point of not allowing any of her Instagram photos to be retouched in any way. She actively criticizes "body shamers." Lawrence completed her catwalk debut at New York Fashion Week and walked in L'Oréal's first fashion show at Paris Fashion week in 2017. Caspar Lee is a YouTube personality, vlogger, actor, and entrepreneur. He started his main YouTube channel in 2012. He was part of the 'YouTube Boyband' that raised money in 2014 for Comic Relief. Yahoo! News named Lee as one of their "12 Web-savvy entrepreneurs to watch" in December 2013. He has appeared in a few films, including playing the voice of a seagull in the UK version of the 2015 movie The SpongeBob Movie: Sponge Out of Water. In August 2017 he announced that he was going to be Chief Innovation Officer at influencer marketing agency, Influencer Ltd.
Tanya Burr is best known for her YouTube channel. She makes videos about fashion, style, and baking. She has collaborated with other well-known YouTubers, including Zoe Sugg, Louise Pentland, Alfie Deyes, Tyler Oakley, and Joe Sugg. Burr appeared on the cover of Glamour UK in December 2015 and Stylist magazine in November 2016. Alexa Chung is a British writer, host, model, and fashion designer. She launched her Alexachung fashion brand in May 2017. She modeled for teen magazines, such as Elle Girl and CosmoGIRL! She later worked for companies including Fanta, Sony Ericsson, Sunsilk, Urban Outfitters, and Tampax. She has continued to model and has been the face of many brands. Chung is also well known for her hosting work, initially on UK’s Channel 4, and then in the US. Daniel Middleton is a British YouTube personality, professional gamer, and author. He originally called his main YouTube channel “The Diamond Minecart,” indicating his love of Minecraft. He still plays that on his channel, as well as other games. His main channel makes him one of the most popular YouTubers in the world by viewership. He is currently the 38th most-subscribed YouTuber. Middleton has three Guinness World Records. One is for "Most views for a dedicated Minecraft video channel." The other two are related: "Most goals scored in a game of Rocket League for a team of 2" and "Most goals scored in a game of Rocket League (team of three)." Louise Pentland is a British motherhood, beauty and lifestyle vlogger, blogger, YouTube personality and author. She is often known online as SprinkleofGlitter. Pentland began her YouTube channel in January 2010. It covers beauty, baby, fashion and lifestyle, motivational and advice videos. She has a second YouTube channel, SprinkleofChatter, but she does not appear to have uploaded any new videos there for some time. London-born 21-year-old Deji Olatunji is the younger brother of Olajide William "JJ" Olatunji, aka K.S.I. Deji is better known on social media by the name Comedy Shorts Gamer. He creates videos that incorporate a unique blend of comedy, gaming, and family pranks. Joe Wicks is a British fitness coach, TV presenter, and author. He presents the Channel 4 show, The Body Coach. Joe states that he is “a man on a mission to rescue people from the awful dieting industry.” He wants to educate people better, to give them the knowledge to build a lean, healthy, strong body. He offers a 90 Day Plan which includes real-time workouts, recipes, and a training plan. Jim Chapman is a YouTube vlogger, blogger, and model. His YouTube and social media channels focus on men’s fashion and grooming. He is a monthly contributing editor for British GQ, and he released his first book 147 Things on 5 October 2017. He was part of the 'YouTube Boyband' that raised money for Comic Relief. Chapman has recently been the face of Hugo Boss watches. Dina Torkia is better known as Dina Tokio on social media. She writes and shares images and videos about fashion, beauty, and lifestyle. Louis Cole goes by the alias FunforLouis online. He is an English film-maker and YouTube personality. He posts a daily vlog on his YouTube channel, documenting his life and travels adventuring all over the globe. Giovanna Fletcher is a British author, presenter, actress, blogger, and vlogger. She has made appearances on ITV's morning TV show Lorraine since 2015. She has a regular blog feature on Hello! Magazine’s website. She has written eight books to date. Fletcher says that her social media posts and YouTube vlogs are designed to “create a fun and positive little place on the Internet for people to come and feel uplifted. I document my life as an author, presenter, blogger and columnist, but most importantly my roles as wife to Tom and mum to Buzz and Buddy.